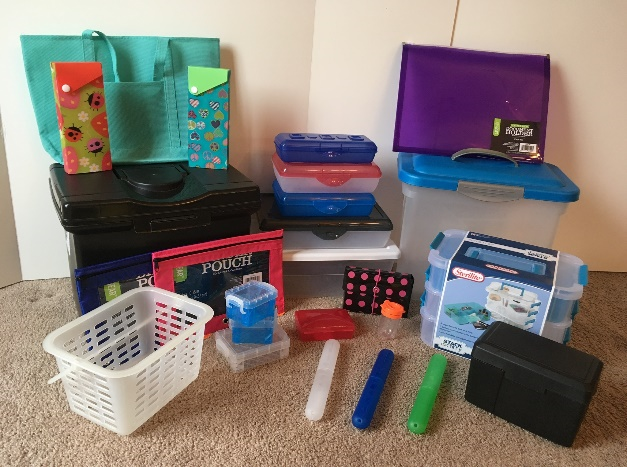 This blog post by contributor author Regina Parsons-Allen describes occupational therapy activity kits that can be used to address a variety of occupational therapy goals using themed OT kits, saving time and planning for therapy. Pediatric and school-based occupational therapy practitioners are busy people. Often times, they see many children and can work with preschoolers to young adults in a single day. They are challenged with keeping children actively participating in therapy while building skills to achieve their OT goals. Pediatric and school-based OTP’s must analyze, plan, prepare, implement, modify, adapt, grade, problem-solve, reflect, research, document, collaborate and consult for each child they serve. To say the least, they are busy, busy, busy and the “OT” never turns off! Edit: This is part TWO of a series on occupational therapy toolkits. You can find more OT activity toolkit ideas here. 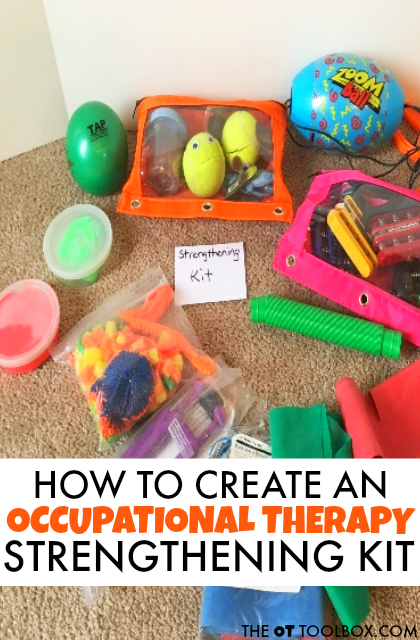 Having a pre-planned set of occupational therapy activities in mind can be a huge help when it comes to addressing fine motor skills, visual motor skills, sensory processing needs, or other underlying areas interfering with function in the school, home, or community. 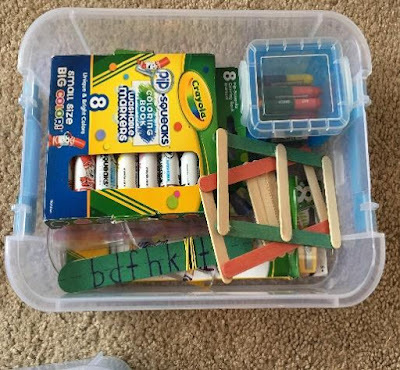 These occupational therapy activity kits are perfect for incorporating into a bin rotation system, much like these fine motor bins. 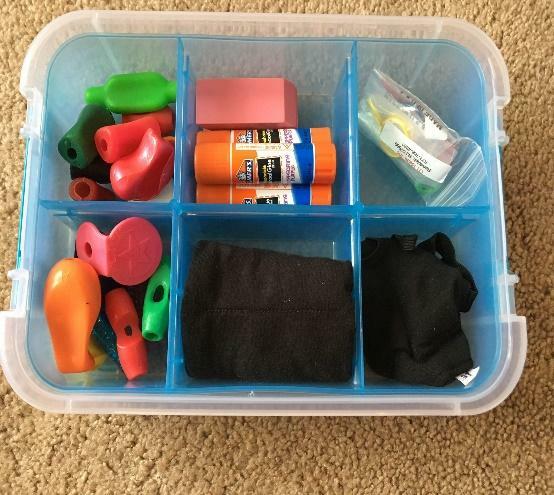 What is a themed occupational therapy therapy activity tool kit and how do I make one? 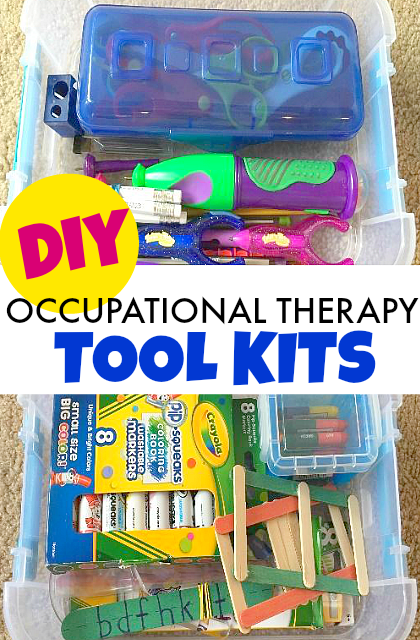 Themed occupational therapy tool kits are a great way to invest some time now, but save a ton of time later. They help make a therapist’s job easier when planning, preparing and documenting. 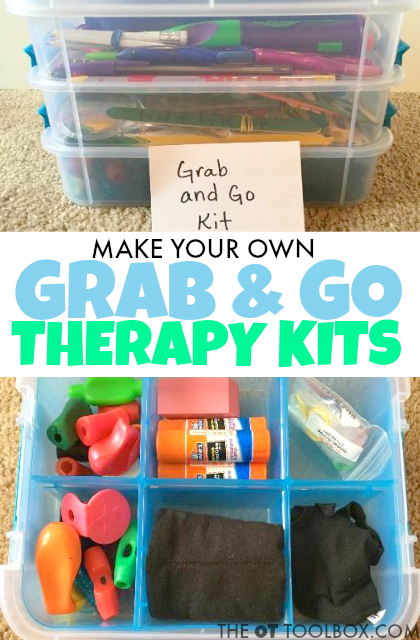 Tool kits are a great way for therapists to have what they need in an organized kit and ready to use with many kids at any given time. They are portable, all inclusive, and separated by a theme. Grab and go kits are the goal! Holiday or seasonal themed tool kits contain activities that allow for “celebration” of holidays or events while heaping fun and play into a single session. Let’s face it, children love the holidays and these themed tool kits keep kiddos engaged and help them build skills for development and success. Kiddos love to see one coming their way! They know fun and surprise are inside while therapists know kiddos will be motivated to “work” on their therapy goals. Tools of the trade kits may contain the staples for pediatric or school-based OT practice. More specifically, tools that are used during most OT sessions to include scissors, pencils, grips, paper, etc. The kits have specific tools that are essential for intervention, assessment, progress review, or trial. 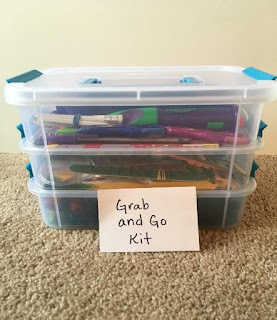 These grab and go kits always contain a variety of tools, graded in nature, standard or adaptive, which are utilized by a wide range of kiddos with various levels of skill. 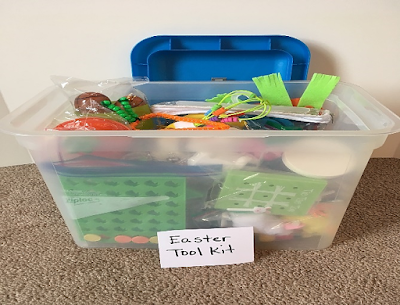 Other tools of the trade kits may contain therapy tools or materials that develop a targeted skill area such as fine motor, gross motor, strengthening, sensory processing, self-regulation, etc. The kits contain specific tools or materials that are needed mostly for specific intervention programming. Holidays – Easter, Christmas, Fourth of July, Thanksgiving, Halloween, Valentine’s Day, St. Patrick’s Day, etc. School Celebrated Times – Back to School, Dr. Seuss Day, Fire Safety, etc. Skills – fine motor, gross motor, sensory, visual motor/visual perception, strengthening, prewriting, handwriting, dressing, oral motor, self-care, reading, etc. Tools – scissors, writing/coloring implements, grips, tongs, feeding tools, fidgets, etc. Purpose – therapy session, screening, assessment, classroom inclusion, trial, therapy homework, etc. Design – material, sectioned or non-sectioned, handled or non-handled, portable or non-portable, lid or no lid, stackable and/or slidable, etc. Let’s talk tips on how to make one. 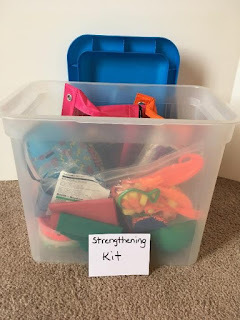 Building tool kits for therapy can be done over time or immediately depending on the purpose, availability of items or materials, and funds for purchasing. Gather all tools, materials or items you already have and simply start developing your tool kits based on what you already have. Then make a list of tools, materials or items you would like to add. Start small so that it doesn’t get overwhelming. Know that your kits may, and probably will, start small and change over time. This is okay and sometimes better when you are first starting out in the field of OT. Don’t be afraid to ask colleagues if they have some extra tools or items they would be willing to part with to help you stock your tool kit. OTP’s are generous people and willing to offer help. Just ask! Look for items at the big retail chains such as Wal-Mart and Target. Look in the clearance, dollar, and seasonal sections. Check out weekly sales. Shop for items after the season or holiday is over to prep for the next year. You can get awesome deals such as 50-80% off of the regular price. Even check the craft sections for deals! Search dollar stores for fun activities or ideas. Think outside of the box with items!! Hint: try to pick items that have versatility so that you can reach a larger age range or items that can be combined to address a variety of needs. Go to thrift stores and take a peek, you can find some great one-of-a-kind or classic items that will work great in a tool kit. Shop garage or yard sales and go to the toy sections or even those miscellaneous trinket boxes and look, look, look. Get on email lists for some of the therapy companies that sell products so you can keep “in-the-know” when products go on sale or when new products are available. Pick a kit container that best fits the objects you have, the design you like, the clients on your caseload (clear containers peak the most interest) and the portability and durability that you need. Buying stackable containers keeps the storage, organization, and the ‘grab and go’ approach easier. Also, consider if you like handles for single hand carry or if handles are not necessary. Shop a variety of stores to find the type of containers you want or need. Check office, craft, and storage departments in bargain stores, big chain stores, dollar stores, online stores, and craft stores. Sometimes craft stores have great containers with many organizational possibilities. Store items in your kit using various containers, especially if you have a large drop-in container vs. a sectioned container. Consider using zipper baggies, twist top or flip top containers, button or snap containers, zipper pencil bags, squeeze containers, and other recyclable containers, etc. Build fine motor skills with the containers inside! 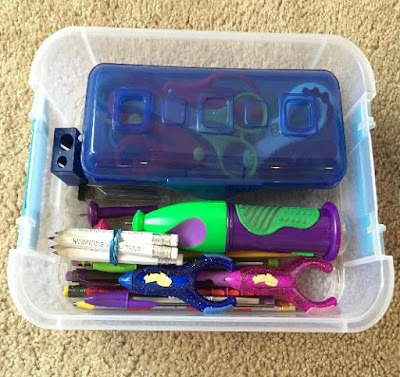 Consider keeping a few staples in each container such as writing or coloring tools, scissors, glue and paper. Or maybe you want to have those in a separate tool kit to ‘grab and go’ with your other kits. It’s your personal preference with this one! Seasonal and holiday kits are fun activities contained in one kit which can reach a huge range of kiddos with many types of needs. OTP’s can splash the activities with a little creativity and modification to hit it out of the park during therapy sessions. 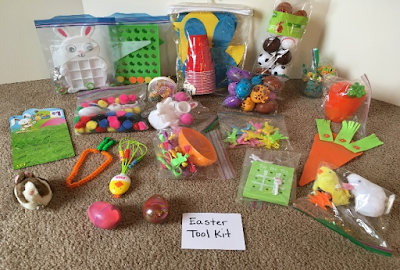 Below is an example of an Easter holiday themed tool kit and its contents. I lovingly refer to this kit as a “dump and run” kit because I can dump in the contents and run from session to session or site to site with little organization other than the use of some baggies. Tools of the trade kits contain specific tools, devices, or materials which are all inclusive from standard to adaptive and may either contain purchased or DIY contents. OTP’s need these essential tools for treatment, trial, loan, or assessment to determine level of performance, therapy plans, and interventions. Below is one example of a small, tiered container with a combination of regularly used OT tools for use during treatment sessions. It is a simple tools kit that stays organized so I can grab it and go from similar sessions with all of my therapy staples in one kit. 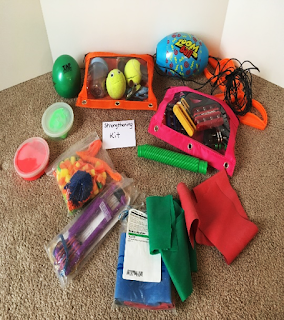 Below is an example of a targeted skill area kit which contains therapy tools and other materials that develop the targeted skill of strengthening. It contains specific tools of the trade and other miscellaneous materials. 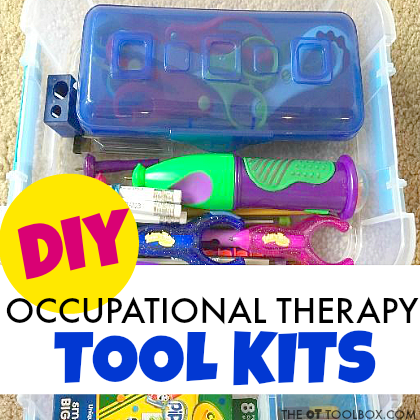 Create an Occupational Therapy Tool Kit to address areas like handwriting or scissor skills. Themed therapy kits will make your life as a pediatric or school-based therapist easier and more enjoyable allowing you to focus on the intervention with the child! Regina Parsons-Allen is a school-based certified occupational therapy assistant. She has a pediatrics practice area of emphasis from the NBCOT. She graduated from the OTA program at Caldwell Community College and Technical Institute in Hudson, North Carolina with an A.A.S degree in occupational therapy assistant. She has been practicing occupational therapy in the same school district for 20 years. She loves her children, husband, OT, working with children and teaching Sunday school. She is passionate about engaging, empowering, and enabling children to reach their maximum potential in ALL of their occupations as well assuring them that God loves them!